If there's a story line that jumps out for the 2016 NHL draft class -- outside of 10 out of 10 scouts surveyed by TSN identifying American Auston Matthews‎ as the pre-season favorite to go No. 1 overall -- it's the dearth of Canadian born-and-bred high-end talent. Americans? No problem. No. 1 ranked Matthews leads a group of four Top 10 prospects from south of the 49th. Finns? You bet. Big goal-scoring wingers Jesse Puljujarvi‎ and Patrik Laine are Nos. 2 and 4 on TSN's Pre-Season Top 15 rankings for the 2016‎ and London Knight defenceman Olli Juolevi is No. 13. Canadians, at least those born and developed in Canada, are nowhere to be found in the top six pre-season prospects and there are only five in TSN's Top 15. That doesn't mean there is any need for panic or a hockey summit. Given the quantity and quality of high-end Canadian talent in recent drafts -- most recently Connor McDavid -- this looks more like an anomaly or something that is cyclical in nature. Nevertheless, Mississauga Steelhead centre Mike McLeod is the highest-ranked Canadian-born-and trained player. He's at No. 7 on TSN's list. Now, Sarnia Sting defenceman Jakob Chychrun, who is in a dead heat with Puljujarvi at No. 2 on TSN's list, is a dual (Canadian-American) citizen. Chychrun's dad Jeff is Canadian born, a former NHL defenceman (262 regular season games with Philadelphia, Los Angeles, Pittsburgh and Edmonton) who played junior with Kingston of the OHL. But Jakob was born in Boca Raton, Fla., and played his formative hockey in Florida before first moving to Detroit (Little Caesars) and then Toronto (one year with the Junior Canadiens). The first overall pick in the 2014 OHL draft has chosen to follow the Hockey Canada path for Under-17 and Under-18 international events but because he's coming off shoulder surgery‎ and didn't actually suit up for Team Canada at an IIHF-sanctioned Under-18 event, he's technically still eligible to play internationally for either Canada or the U.S. There doesn't appear to be any reason he won't suit up for Canada internationally but there's no denying his U.S. Sun Belt heritage. In fact, if Matthews -- who was born and raised in Scottsdale, Ariz., as a Coyotes' fan -- and Florida-born-and-bred Chychrun were to go one-two at the 2016 Draft in Buffalo, the story line will be the NHL's sown Sun Belt expansion seeds bearing fruit like never before. The No. 5 slot on TSN's list also belongs to an American. Matthew Tkachuk, the son of former NHLer Keith Tkachuk, was born in Scottsdale but played his formative hockey years in St. Louis. Funny enough, the No. 6 pre-season prospect was born in Calgary but couldn't be more Swedish. Alex Nylander, son of former NHLer Michael Nylander and younger brother of Toronto Maple Leaf first-rounder William Nylander, will play for Mississauga in the OHL but will wear Sweden's colours internationally. McLeod starts a run of three Canadians, with Cape Breton Screaming Eagle two-way winger Pierre Luc Dubois at No. 8 and Brandon ‎Wheat King puck-moving defenceman Kale Clague at No. 9. Big winger Max Jones, a brash goal-scoring American with raw power, rounds out the Top 10 on TSN's pre-season list. Diversity continued to‎ be the theme for those ranked 11 through 15, including Canadian winger Julien Gauthier (nephew of former NHL defenceman Denis Gauthier) at 11, Russian forward Dmitri Sokolov of the Sudbury Wolves at 12, Finnish defenceman Olli Juolevi of the London Knights at 13, Canadian winger Tyler Benson of the Vancouver Giants at 14 and Russian defenceman Mikhhail Sergachyov of the Windsor Spitfires at 15. Ironically, while the Top 15 is heavily non-Canadian, 12 of those 15 are playing in the Canadian Hockey League, including every prospect from No. 6 to No. 15 and the top-ranked Russians in this year's draft. With Tkachuk, Jones and Juolevi, the London Knights are stacked with high-end draft-eligible talent. -- Scouts aren't too concerned that Matthews has taken the unprecedented step of a potential No. 1 pick playing his draft year in the Swiss League‎ (for Marc Crawford in Zurich). Matthews only missed being eligible for last year's draft by two days. Had he turned 18 on Sept. 15 instead his Sept. 17 birthday, he would most certainly have joined Connor McDavid and Jack Eichel in the NHL this season. He's a physically-mature, high-skill centre who projects, like McDavid and Eichel, as a No. 1 NHL pivot. -- While Matthews was unanimous amongst the 10 scouts surveyed as the top prospect, some said Chychrun, Puljujarvi and Laine can mount challenges to him. But Matthews is the odds-on favorite to be No. 1 next June. -- The elite-level first layer of this draft, based on voting points anyway, is four deep. Chychrun and Puljujarvi, who received identical rankings from all 10 scouts, and Laine‎ join Matthews (for now) at the top of the class. -- Tkachuk was solidly ensconced at No. 5, but the rankings for all players outside of the Big Four were far more scattered and not nearly as definitive. -- Every player ranked in the ‎Top 15 had, at minimum, three votes as a Top 15 pick. -- Other prospects who received more than one Top 15 vote but fell short of being in the Top 15 included honourable mentions: defenceman Dante Fabbro and forward Tyson Jost, a pair of Penticton Vees Jr. A players; Kelowna Rocket forward‎ Dillon Dube; Windsor Spitfire forward Logan Brown (son of former NHL defenceman Jeff Brown); U.S. U-18 program forward Kieffer Bellows (son of former NHL forward Brian Bellows); and, Regina Pat forward Sam Steel. -- Another 11 prospects got one Top 15 vote apiece, meaning there were 30 prospects overall who received consideration in the balloting to determine the Top 15. 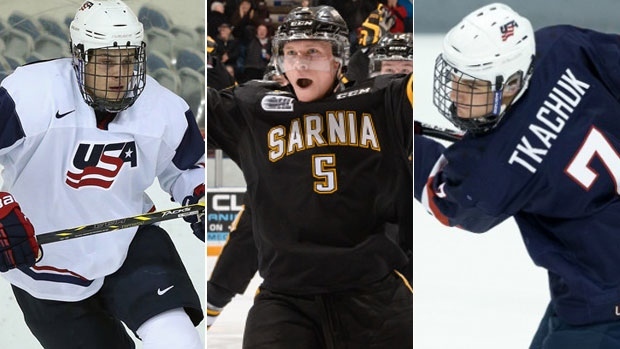 TSN's next 2016 draft rankings will be at mid-season, in late January. Elite, complete centre who can take advantage of any situation on the entire ice surface. Two days is the only thing that separated him from being in the NHL this season as he missed the 2015 draft being born less than 48 hours after cutoff date. Outstanding skater who beats pressure defensively, can join the offensive thrust in transition and doesn't break down defensively. Capable of being a complete No. 1 blueliner. Elite scoring winger who has an excellent feel for getting open and the hands and shot to challenge goalies. A big man who skates with ease and has a hunger and fire to score. A scorer with the instincts to arrive at the right spots to take advantage offensively. Drives to net and has a determination to get to net and battle for his opportunities. Can play a skilled game making plays or finishing them. Is excellent in the hard areas, very smart and plays with an edge and undeniable determination. High-end natural skill with ease to his skating and the ability to beat defenders in multiple ways either with skill, his shot or intelligence. High RPM motor that finds ways to impact the game in multiple areas. Excellent skater and uses it to get offensive chances or to disrupt opponents. A strong, hard winger who carves out room and space for himself and gains advantages for the team. Smart with the puck and is highly productive in all areas. Exceptional puck play and with excellent vision, he can find open players and create the opportunities that generate Grade A scoring chances. Excellent poise. The blend of power and skill that can impact the game in a significant manner and makes defenders weary because he can take advantage in either form. Strong, physically capable winger who is extremely difficult to deter and play one-on-one. Gets to scoring areas and can beat goalies in multiple ways. Excellent skill and sense. Aware of opportunities and can take advantage with his skill, his power or his vision to create scoring chances and back up defenders. Very smooth, heady defenceman who has excellent economy of effort. Excellent passer and exhibits in all three zones and has a calm and poise to his play. Well-rounded player who finds ways to contribute with and without the puck and can play in all situations. Uses body well, has excellent sense and is a great competitor. He delivers for a team offensively and defensively and does it in all manner of ways. Strong skater. Offensively can pass or shoot. Very good defender and has a physical edge. The following prospects were close to cracking the Top 15, but were edged out in votes. Eleven other players got a single vote each, so 32 players in total received at least one vote as a Top 15 pick.